2000-present (not on the touring line-up). It is unclear whether Brain has been part of the "studio lineup" of GN'R after he stopped touring with the band in 2006. 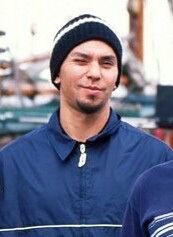 Born in the South Bay city of Cupertino, California to an Italian-American father and a Japanese American mother, Mantia became interested in such 'groove heavy' artists as James Brown, Led Zeppelin, and with Buckethead outside of Praxis – playing on such solo Buckethead albums as Giant Robot and Monsters and Robots. The late '90s saw Mantia appear on releases by Godflesh (Songs of Love and Hate, Love and Hate in Dub) and the instructional video Brain's Lessons: Shredding Repis On the Gnar Gnar Rad, which includes the Ostinato and the Up Down Technique. The video is shot to look like a home movie and includes many humorous moments including a sit down steak dinner with his parents right in the middle of Brain "shredding" on a toy drum set. As a parody of late 90's gangsta rap, the cover is done in a Pen & Pixel style similar to No Limit Records and Cash Money Records releases. Although silly at times, the video is extremely informative for drummers looking to learn the hard grooves he is known for. Mantia appears on several songs on BT's 2003 release Emotional Technology as well BT's score for the 2003 film Monster. In the early summer of 2006, after four warm-up dates in New York City, Mantia toured Europe with Guns N' Roses. On June 21, 2006 it was announced he was taking a break from the GN'R tour. In Brain's absence replacement drummer Frank Ferrer has been performing in most of the band's shows. In the Fall of 2006, Ferrer was promoted to an official member of the band, which fueled speculation that Mantia had resigned or been fired from Guns N' Roses. However, Axl Rose mentioned him "working on things for the band" during his fan-forum interviews in December 2008. In the liner notes for GN'R's 2008 album, Chinese Democracy, replacement drummer Frank Ferrer thanks Mantia, saying "[Frank Ferrer would like to thank]... Brain, God bless you and your family." Additionally, Rose is rumored to have briefly considered a rotating drummer line-up for the 2009-10 leg of the Chinese Democracy World Tour that would have seen Mantia playing the band's Chinese Democracy material while Ferrer played the band's classic material. Ultimately, Brain only ended up making a guest appearance at Guns N' Roses' House of Blues West Hollywood show on March 12, 2012 playing congas on "You're Crazy" and "Rocket Queen". I have tremendous respect for the drummers in Guns N’ Roses. I love Brain so much. What Brain told me was to try and make the songs my own. I never forget that [Music Radar, June 2016].